When you rent a property, you can often be highly restricted in terms of what you can and cannot do with it. One thing that landlords often stipulate that their tenants cannot do is paint the walls of the property. But, when faced with bare white walls for the duration of your tenancy, you may well find yourself craving for a splash of color. So, why not follow the 4 simple and effective tips below to turn your rental house or apartment into a bright and colorful living space? If you have brought your own furniture to the property, then a simple lick of paint can turn those plain wooden tables and chairs into gorgeous centerpieces of a kitchen or living room. Add some colorful throws, table runners, table cloths and cushions to put the finishing touches on your ‘new’ furnishings. Vases full of flowers are absolutely beautiful things to have around your real estate property in the Philippines with such a bounty of perennials. Not only do they add a sense of freshness and life to the place; they can also make your apartment smell absolutely elegant. One thing that flowers also add is color – and lots of it. So why not experiment with enameled vases and bold combinations of hues as you arrange the flowers within them? Here is a great design tip from the professionals: use a dove gray hue to deepen the colors that you have in your home. Something gray will help to make blue look brighter, yellow bolder and red more vibrant. So, if you have a blue sofa, why not add some neutral gray cushions (or vice versa?). Another tip is to choose hues that have a little gray mixed in to them, such as steel blue. Some apartments have gray walls rather than white, which makes them easier to customize as you please in terms of color. Get the best condo for rent on Zipmatch for a better comparison between aesthetically-focused rentals in the metro by taking a 360 virtual tour to find the color you like. A vibrant rug will instantly transform a bare wooden floor into something much more cheerful. 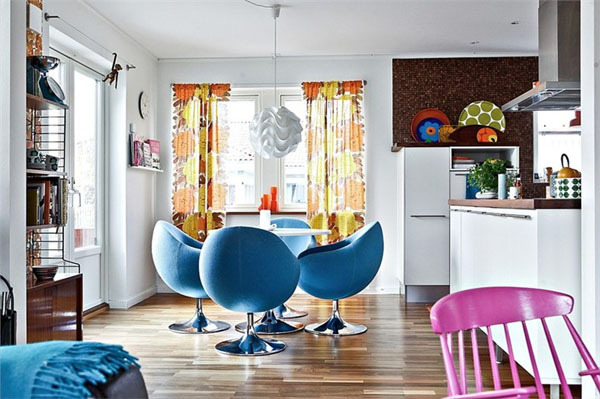 You can throw colorful rugs over a carpet, over ceramic tiles or over wooden boards as mentioned above. Large rugs are also an inexpensive way to carpet your home – and you can pick them up and take them with you when you move at the end of your tenancy. Painting your walls can seem like such a commitment. The tips above, however, all have the virtue of being impermanent. Experiment with different bouquets of flowers, rugs of different hues and different throws, cloths and cushions on your furniture to change the look and feel of your apartment in the blink of an eye.